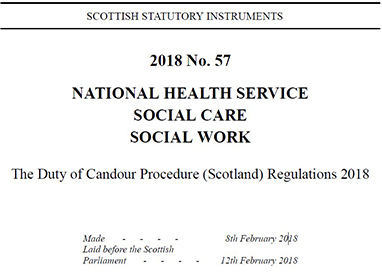 The Duty of Candour Procedure (Scotland) Regulations 2018 have been published and come into effect on 1st April 2018. Guidance on implementing the duty of candour will be published. AvMA has been working with the Scottish Government over this. Meanwhile however, there has been no news about the proposed ‘No-blame Redress Scheme’ which was consulted upon in 2016. AvMA is seeking clarification from Scottish Government.